Those familiar with Spread betting or Forex/CFD trading will be aware that your cost to trade is known as the 'Spread'. The Spread is the difference between the price you buy a market at, and the price you sell a market at. For example the Wall Street 30 Index may be quoted at 12564 to 12566, a difference of 2 points between where you can buy at 12566 and where you can sell at 12564. If you were to buy and sell immediately for £10 a point then you would have lost £20. This is because you bought at 12566 and sold at 12564, a loss of 2 points at £10 per point. This £20 lost is your cost to trade and is how Brokers make money from your trading. Whether a Broker offers you Spread Bet, Forex or CFD services they are all businesses who are looking to attract new clients to their services. Brokers earn their revenue from the spread they charge, and more clients mean more people paying spread, generating them more revenue. Brokers have a marketing budget to attract new clients to their services. Some of this budget is allocated to Introducers, who act as an outsourced marketing agent, and are paid to refer clients to the Broker. 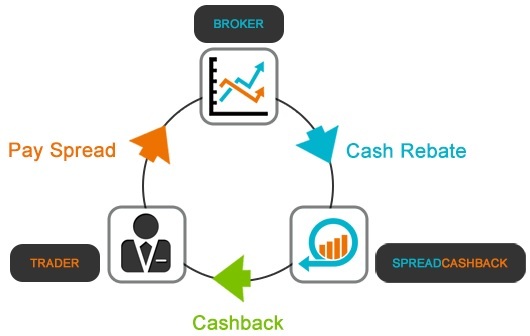 Spread Cashback acts as an Introducer to the Brokers. When you register for a new account using our site, the Broker pays us a referral fee every time you trade. Spread Cashback then pays a high proportion of that referral fee back to you in the form of Cashback. Cashback is an increasingly popular and legitimate mechanism for individuals to cut their cost when purchasing any type of good or service, not just financial trading. Spread Cashback choses ONLY to work with Brokers who do NOT add additional charges when opening their account through us. Our listed Brokers only charge the same spread or commission that you would have paid if you had registered with the Broker directly. This is because the fee paid to us, and subsequently to you, is paid from the Brokers marketing budget and not from any additional charges levied upon you. So how do I start earning Cashback? The process is quite straightforward and is provided in detail below. Register for a Spread Cashback account. Dont worry its a simple process that will take less than a minute. Click here to register now. Find a Broker that suits your needs. We offer a number of tools to help you select the Broker that best suits you. Once you have selected your Broker click the 'Sign Up' button alongside and you will begin registering for a new account with your chosen Broker. Upon receiving details of your new Broker account, you now need to connect it to your Spread Cashback account. Log into your Spread Cashback account and select the 'My Brokers' section. Then simply enter your Broker Account details into the 'Add a Broker Account' box. Once submitted Spread Cashback will verify the account with the Broker and confirm once it is ready to start earning you Cashback. You are then ready to start earning your Cashback. At the end of each month the Broker send us details of the rebate earned on your account. We then credit your Spread Cashback account with the Cashback you earned. You are then free to withdraw it and spend the proceeds however you choose.